I have to admit, I was pretty pissed off…. We had just had an awful meal at a restaurant (thankfully the first dismal failure of the trip). I won’t spell it all out because I’ll just get annoyed again, but the crowning glory of the lunchtime disaster was when Jeff cut into his fish, nicely-enough presented, and discovered it had not been cleaned properly and was still mostly full of guts and gore. Then it took forever for the bill to come. In Portugal, Spain, and now in France, we’ve learned, we have to ask for the bill or it will never arrive. I asked for it, en français. I asked for it again, again en français. Finally, we got up and went over to the till, which is a slightly aggressive move but one we have seen others do when they were in a bigger hurry than the restaurant staff, so I knew it was within the limits of acceptable behaviour. Then a man pushed in past me to stand ahead of me at the till. Little did he know how elevated my mood already was, courtesy of the gross grub. I sort of glided past him again — I didn’t push — to stand at the front of the till again. When the server finally came, the man pushed past me again and the server responded by looking after him instead of me, whom he had seen standing there for a bit already. Now, I was really pissed off. I turned to the man and told him off…en français… To my surprise, it just kind of bubbled out of me. Chances are, it was closer to gibberish than real French, but my message got through clearly enough, and he fired back in high-speed French that this was his country and it was his right to go first, and additional stupid words to that effect. So I said back, I think probably with a little bit of haughtiness when I reflect back on it, that I was a visitor and I was there first. For a moment, that was enough. He just stopped dead for a second and stared at me. Like, as if he were thinking to himself, “She understood all that?” (I didn’t, but I got enough to get the point.) Or, he might have been thinking, “Canadian? I thought all Canadians were nice. What’s with her?” I dunno. I don’t care, actually. I stopped him cold for a moment, and that in itself was rather satisfying. Recovering himself, he started in on more jabbering, and I just said “C’est fini” and turned my back on him. He tried to say something else and I just repeated myself, with all my “I’m really pissed off at you” attitude. Then I said, to no one in particular and everyone in general, “How rude,” in plain, clear, emphatic English. It wasn’t until I saw the slightly alarmed look in the server’ eye that I realized the pair of us had been making a bit of a scene, and so I took advantage of that and dumped on him, next. I told him the fish was disgusting (in a mix of English and French, my French was close to exhausted by then), and showed him a picture of the pile of fish guts on Jeff’s plate. With great haste and much deference, all of which had been lacking up until that moment, he offered to remove the charge for Jeff’s fish off the bill. I accepted, we had the bill cut almost in half, paid it promptly, and left. I think he thought he was glad to see me go, but that was nothing compared to how glad I was to be gone from there! I think dear, sweet Jeff was slightly embarrassed, or at least felt rather awkward, as things unfolded. But, when all was said and done, I think he was so pleased at the effectiveness of the final result of getting his meal credited when we had great doubts that it would be possible, that that assuaged at least a little of his discomfort. And then I replayed it all in my head, and realized everything that had just transpired…in French. I had no idea I had that much of it in me to be able to have an argument with a jerk in a restaurant. I’m not sure if my teachers in school would be proud or horrified, but I have to admit that I was pretty darned pleased with myself when I thought about it all afterwards! It takes a lot for me to dig in my heels like that, but together the restaurant and the pushy guy succeeded in getting me to that point, and there I was, with my Irish ire on red alert and, to my astonishment, my high school French flooding back onto my tongue and into my brain. What a jerk…and what a disappointing meal. But you know, they actually did me a favour: I feel so much more confident about coping with basics in French now. I really had a lot of fun with it at our dinner meal, where I’d been nervous about trying to say anything in French before that, so that’s kinda cool! As we were leaving the square (more specifically La Place de la République, Arles, France), we saw this big tour group clowning around and getting their photo taken. “That’s nice; they’re sure having a lot of fun,” we commented to each other. 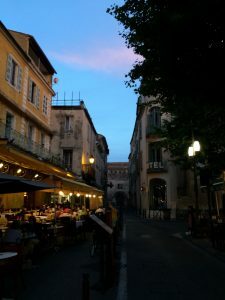 We sauntered off down the “road,” thinking it was about time for an afternoon coffee and getting about a block away in our search for a café, when we suddenly heard this amazing choral music coming from behind us. We turned around and zipped back, me pulling out my iPhone as fast as I could, and we captured most — not all — of the piece. The tour group wasn’t a tour group after all, it was a choir, and a very good one at that! Jeff and I were thrilled with the unexpected musical treat, and hope you enjoy it, too! After dark yesterday, in Arles, France, we stumbled around looking for a late-opening place to eat dinner. Our travel day had gone more slowly than planned, and we were only just getting to dinner at about 10:30 pm. So, we wandered off, hungry (down a “road” fit for a bicycle and nothing more yet used frequently by speeding cars that barely fit between the curbs), wondering what we would do if we couldn’t find anything open. To our surprise, we rounded a corner and suddenly found ourselves in a bustling square surrounded by restaurants and cafes! Relieved, we scanned a few menus, rounded another corner to look at a few more, and then I looked up. Suddenly I was standing in the middle of the very print that had hung on my bedroom wall for years! I just stopped and stared. “Surreal” is the word that comes to mind. Finding myself in the middle of a Speed Racer episode, back when I was four or five and it was my very most favourite cartoon, might have topped that moment, but even that’s not a certainty. Do you recognize this scene? Can you name the painter? Do you know the painting I’m referring to? Oh, and I had herbed lamb with mushroom rice and sautéed veggies, while Jeff had a still-mooing steak with French fries and different veggies. It was good, the wine was great, and it only cost 54€! We’d love to have you join us on Instagram! We’re called @happywanderers_ca… easy to find!